Hi Paper Lovers! I'm thrilled to pieces to be a Guest Designer for My Creative Time again. Especially since now that we know Emma's son Aaron is on the mend and getting stronger everyday! First thing I did was to fold in half thin white cardstock. 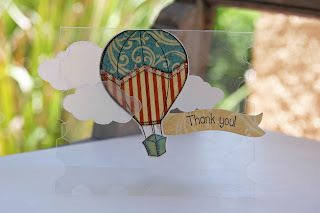 Then I placed the hot air balloon die so the fold of the paper was just below the top cut line. Yes it will make the balloon flat on the top. 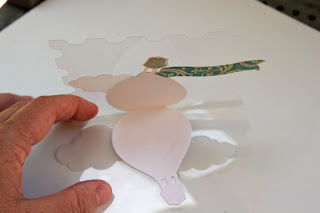 This cut was glued inside the card. Then I stamped two balloons, one out of the blue and one out of the red. After cutting both images out I paper pieced them together. After inking the balloon, I used glitter for the center. I glued the patteren paper balloon to the front of card directly over the white die cut. I also cut 3 clouds out of the vellum and placed 2 clouds on the front of the card in front and behind the balloon. And I also placed one on the inside of the card. By placing the clouds on the front and on the inside, it creates alot of depth. 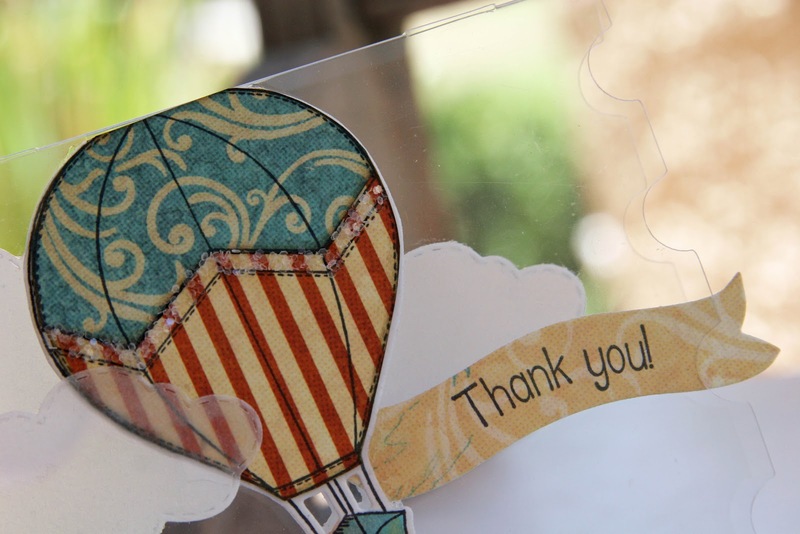 Creating the folded die cut allows for writing in the card! I LOVE this Liz!! What a great card and thanks for the tip!!! Love all of the details on how you did this! Great tutorial!!! Liz ~ BEAUTIFUL card and LOVED the tip!!!! Of course I LOVE the paper! I totally forgot to put in my comment over at Emma's blog ~ prayers are still heading their direction! SO happy that Aaron continues to get stronger and healthier everyday! 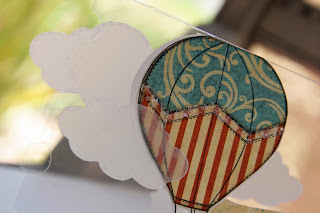 Clever job on your card to use the clear cardstock and vellum for the clouds...it does looks like the balloon is floating with the clouds. Great job! What a great idea for a unique card! TFS! Where did you get clear cardstock? 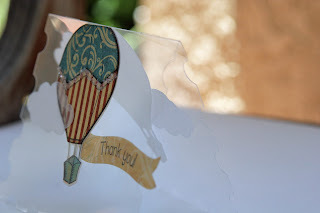 I got the clear cardstock at Papertrey Ink. They have great prices! This is fabulous! 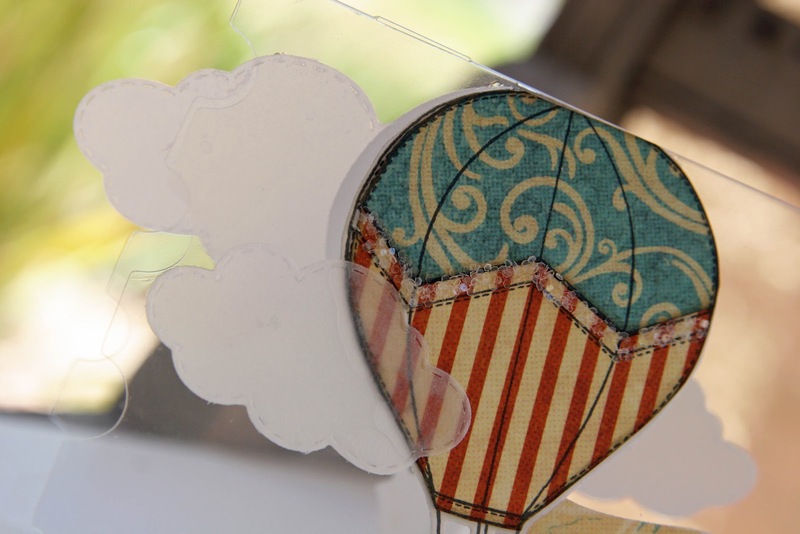 I love the papers you chose for the balloon, the fact that you made the clouds out of vellum and the fact that you layered them all! TFS!! !